The full presser's below, if you're into that sort of thing. NEW YORK, Aug. 15, 2012 /PRNewswire/ -- Samsung Electronics America Inc., a market leader and award-winning innovator in consumer electronics, today announced its highly anticipated GALAXY Note 10.1 for the U.S. market. The device will be available for purchase tomorrow - August 16th, 2012 - across the U.S. at authorized retailers. At a launch event in New York City, Samsung will be joined by fashion designer Zac Posen, who has created looks for the most elite stars, and acclaimed writer, producer, director Baz Luhrmann (William Shakespeare's Romeo+Juliet, Moulin Rouge and the forthcoming The Great Gatsby). Each will provide a window into their own creative process, and how the GALAXY Note 10.1 will unleash new levels of inspiration in their work. The GALAXY Note 10.1 extends the GALAXY Note category, building on the success of last year's worldwide hit smartphone – and delivering the functionality and precision of a pen and paper by combining the S Pen with a 10.1-inch large display. Adobe's premium creative application, Photoshop® Touch is preloaded and optimized for Samsung's S Pen to deliver unprecedented precision and control. The device also introduces the game changing Multiscreen feature, which allows users to actually operate two different apps side-by-side, simultaneously, on the same screen. 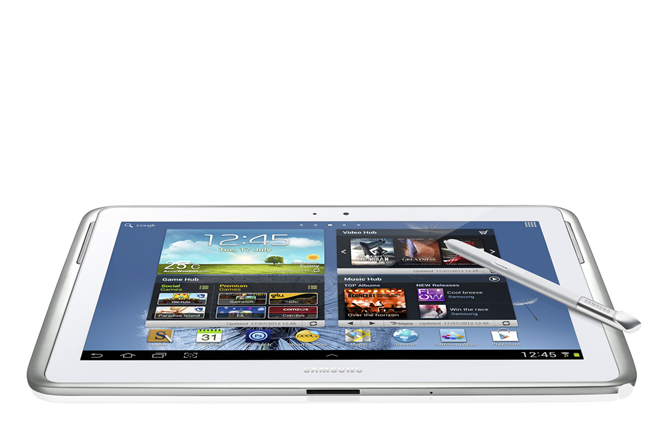 Thanks to a 1.4GHz quad-core processor and 2 GB RAM, the GALAXY Note 10.1 can handle it all without missing a beat. "Our goal with the Samsung GALAXY Note 10.1 was simple – redefine the tablet experience," said Tim Baxter, President, Samsung Electronics America. "The S Pen offers both active content creation as well as passive content consumption, while the Multiscreen capability finally enables true multitasking. For the user, the resulting experience is completely new and quite unexpected." With GALAXY Note 10.1's Multiscreen feature, users can effortlessly utilize two different applications side-by-side simultaneously for true and easy multitasking. Users can view Web pages or videos, or launch other applications while writing or sketching ideas with the S Pen on the other half of the screen – no need to toggle back and forth between apps. Further, users can even capture and crop images from an app on one side, and drag them to an app on the side – for enhanced creativity and productivity. Apps supported for Multiscreen are S Note, Internet Browser, Video Player, Email, Gallery and Polaris Office . The GALAXY Note 10.1 thus meets the increasing needs of a growing mobile workforce, from interfacing with customers to creative sharing. The GALAXY Note 10.1 also offers the Pop up Play feature first introduced on the GALAXY S III Smartphone. With it, users can play back videos in a floating window that can be overlaid anywhere on the screen, providing a "picture in picture" experience. New for the GALAXY Note 10.1 is the ability to adjust the size of the video window. In addition, GALAXY Note 10.1 offers a mini-apps tray that can launch a selection of mini-apps on top of others apps and freely moves around the screen. These include Alarm, S Note, Music Player, Email, Calculator, World Clock. Featuring an advanced S Pen with 1,024 levels of sensitivity, GALAXY Note 10.1 is designed for natural and intuitive content creation. The S Pen is embedded directly into a slot in the device and when removed, activates a taskbar with quick access to optimized S Pen apps such as S Note, Adobe® Photoshop® Touch and Polaris Office. Alternatively, users can easily set their preferred application to be launched instantly. The S Note application is a unique tool that gives users the ability to combine notes and sketches with other digital content in ready-to-use templates. Shape Match converts hand-drawn shapes such a square and lines into clean and perfect versions – perfect for creating charts. Formula Match can actually solve formulas hand-written with the S Pen. Adobe® Photoshop® Touch, normally a $9.99 purchase, is preloaded on the GALAXY Note 10.1. Further, since it is optimized for S Pen, users are able to control brush size and opacity by just adjusting the pressure of the pen on the screen. "Samsung's GALAXY Note 10.1, with its pressure-sensitive S Pen, truly unleashes the power of Adobe Photoshop Touch and provides a great tool for creative expression," said Winston Hendrickson, vice president products, Creative Media Solutions, Adobe. "More than ever, people around the world want to create, wherever and whenever inspiration strikes. We look forward to seeing what they imagine with the S Pen and Photoshop Touch." Users can also use popular Photoshop features such as layers, selection tools, adjustments, and filters to create mind-blowing images, or use the high quality GALAXY Note 10.1 camera to fill an area on a layer with the unique camera fill feature. With Photoshop Touch, it's also a snap to add or remove people or objects from a photo, or blend two photos together. To get users started quickly, in-depth step-by-step tutorials are provided to help users learn techniques the pros use for great-looking results. Samsung is adding even more value through a range of partners. Kno, a pioneer in education software, will offer its e-textbook platform preloaded on the GALAXY Note 10.1. With it, k-12 or higher education students can say goodbye to heavy backpacks filled with books and instead, download any of thousands of interactive textbooks. Even better, with the new Social Sharing feature announced today, they can utilize the S Pen to highlight and annotate the texts, and share those annotations with other students and teachers in the context of their book. The popular NOOK® free reading app from Barnes & Noble will also be preloaded on the GALAXY Note 10.1 as well as a customized NOOK for Android™ Widget allowing quick and easy access to titles directly from the desktop. A range of other partners are involved as well, delivering a complete solution. GALAXY Note 10.1 is designed with advanced hardware technology, including a 1.4GHz quad-core processor and 2GB of internal RAM. Seamless multi-tasking, high-standard graphics, and blazing-fast performance without any lag are essential features of GALAXY Note 10.1. The device also includes a 5-megapixel main camera and a 1.9-megapixel front-facing camera. The GALAXY Note 10.1 carries over several features first introduced with the hit GALAXY S III smartphone, making it an ideal companion tablet for owners of that devices. ShareShot which makes it a snap to automatically share photos in real time between the GALAXY Note 10.1 and the GALAXY S III. Smart Stay, first introduced with the GALAXY S III, uses the camera in the GALAXY Note 10.1 to prevent the device from going into standby mode while it detects a user in front of the device. Finally, with AllShare® Play, users can share content with a large group in real-time by connecting GALAXY Note 10.1 to Samsung HD TVs, phones, mobile tablets, laptops, and other consumer electronic devices on the same network. WithGroup Cast, users can also share and collaborate on documents, presentations, or images in real time, without loading the files separately. Available Aug 16th Across the U.S.
GALAXY Note 10.1 will be available beginning Aug 16th nationwide at partners including Best Buy, Amazon, Tiger Direct, HH Gregg, CDW, BrandSmart, Conn's and Fry's. In a special promotion, Samsung will also be making the GALAXY Note 10.1 available at BBY's Union Square store in NYC beginning at noon EDT today, Aug 15th. The device will be available in choice of white or dark gray, and in 16 GB or 32 GB memory configurations, for $499 or $549 SRP, respectively. Available accessories include replacement S Pen, S Pen Holder Kit, Book Cover in Grey or White, Travel Charger, USB Connection Kit to allow usage of thumb drives or USB peripherals, HDMI adapter and Universal Desktop Dock.